VeloPress is pleased to announce the publication of the first strength training book for triathletes. 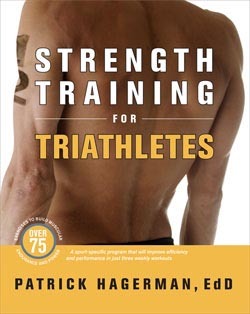 Strength Training for Triathletes by Dr. Patrick Hagerman is a groundbreaking book, the first to integrate strength training into the triathlete's training regimen. Now triathletes who are reaching their highest potential for cardiovascular fitness have a new way to gain performance, without spending more time on the road or in the water. Strength Training for Triathletes is now available in the U.S. and Canada in bookstores, bike and tri shops, and online. Every triathlete wants to be faster, and most know that strength training should be a part of their program. In Strength Training for Triathletes, fitness phenom Dr. Patrick Hagerman explains how small changes in muscle strength add up to big race results. For triathletes, the benefits of strength training are many, from increased stability in the water and on the bike to a faster metabolism. Put simply: stronger muscles can work longer, making strength training indispensable to endurance athletes. Clearly organized by discipline (swim, bike, run) and by muscle group, Strength Training for Triathletes helps athletes quickly find the best exercise for their unique training needs. Every exercise is accompanied by full-color art, making the routines inviting and easy to follow. This groundbreaking book further explains how triathletes can adjust their workouts to emphasize endurance, strength, or power, and how to balance the three to reach race goals. It includes complete information on structuring a periodized weight routine to maximize results for a sprint, Olympic, half-Ironman or full Ironman race distance. Sample seasonal plans for each race distance and instruction on how to adapt training plans to individual needs make it easy for readers to develop specific approaches and reach their personal goals. Paperback with full-color illustrations throughout. Triathlon participation is growing by 22% per year in the U.S.
Dr. Patrick Hagerman is a recipient of the National Strength and Conditioning Association Personal Trainer of the Year award in 2002, Dr. Hagerman has coached for USA Triathlon and USA Weightlifting and has competed in triathlon, cycling, windsurfing, and adventure racing for over 25 years. He is a Fellow of the National Strength and Conditioning Association and a past member of its Board of Directors. He is the Director of Sport Skill Development for Quest Personal Training.